Chock full of information and useful tips, anyone interested in working with young horses is sure to love this video. In four detailed segments, Smith Lilly presents a step-by-step approach to bringing a young horse along from beginning work under tack to working smoothly and confidently at three gaits under saddle. 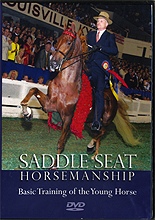 Known and respected by his peers as a versatile and thorough horseman, Smith Lilly brings many years of experience training show horses to the pages of Saddle Seat Horsemanship, the most comprehensive and detailed study available on the subject. After developing his skills working under the direction of noted horsemen Larry Barbee, Mitch Clark, Nelson Green and Fred Sarver, Lilly returned to his familyâ€™s Mercer Springs Farm, which he operates along with his wife, Alexandra and mother, Sandy, as a public training stable specializing in American Saddlebreds. From their base in Princeton, WV, the Lillys have trained crowd pleasing world champions in all divisions, including in-hand, junior and amateur riders, young horses and open grand champions. In all, they have amassed over 100 world and reserve world titles, including Worldâ€™s Grand Championships in the Five Gaited and Fine Harness divisions. While Saddlebreds are their specialty, the Lillys have experience working with many breeds, including Morgans, Arabians, Hackneys, Friesians, National Show Horses and Standardbreds. Smith Lilly also has a history of giving back to the sport. He is a strong supporter of the United Professional Horsemanâ€™s Association (UPHA), and is past chapter chairman for UPHA Chapter 18. Having served in various volunteer capacities for the American Saddlebred Horse Association (ASHA), he is currently chair of the KY and National Futurities Committee. In turn, Lilly was recognized by the ASHA with the prestigious C.J. Cronan Sportsmanship award in 2002, and by the UPHA with the very first Tony Ray Young Professional Of The Year award for 2004. Additionally, Lilly has served on the USEF (U.S. Equestrian Federation) Rules Committee for the Saddlebred division since 2005.